Talented midfielder or wing back who joined Aldershot Town in May 2002 from Peterborough. Spent the latter part of the 2001/02 season on-loan at Dagenham & Redbridge and had previous experience in non-League football before joining the Posh, where he made over 100 League appearances, in August 1998. Started his career as a junior at Brentford and then turned out for Marlow, Yeading and Chalfont St Peter before joining Hayes under current Shots boss Terry Brown in 1994. Moved to Kingstonian in August 1998 before joining Posh. 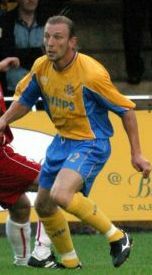 Transferred to St Albans City in August 2004.